Coastal Plains Research Farm protects its important crop and horticultural research from bird damage and biosecurity threats through establishing enclosures with exclusion netting—and the Department of Primary Industry and Resources are about to install more. Currently Coastal Plains Research Farm has an area protected by netting which covers over 80 trees including nine dragon fruit, six carambola, 22 longan, 12 abiu, 14 avocado and 30 passionfruit vines. However more netting is required to accommodate valuable germ plasm and other plant material being relocated from Berrimah Farm. To accommodate the arrivals, the new net will be 140 metres long, 70 metres wide and 6.5 metres high. Construction has commenced this month. Coastal Plains Research Farm is 65km south-east of Darwin, at Middle Point near the Adelaide River and the Fogg Dam conservation area. 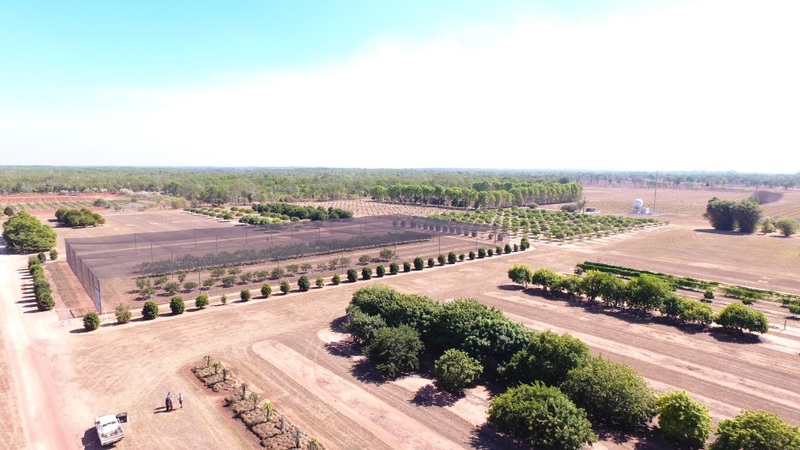 Covering 140 hectares, it’s the NT’s principal horticultural research farm in the Darwin region. Current research projects include evaluation of new national mango breeding program varieties, rambutan, passionfruit, jackfruit varieties and production methods, and testing banana varieties for Tropical Race 4 Panama disease (TR4) resistance.